Blueberries are most famous for appearing at the breakfast table. If you immediately begin thinking about sweet potato banana and blueberry muffins, then you are not alone, they are amazingly delicious! When fresh blueberries are in season you’ll obviously be buying more than 1 single cup of them (as required for this glazed pork chop recipe), so plan on buying a large enough amount in preparation for an early morning snack tomorrow. They also compliment many meats, and while we have already explored a duck and blueberry stew, for the moment we are sticking with our slightly spicy blueberry-drenched pork chops. Why eat blueberries, besides being attracted to their beautiful color and ever so sweet enticing taste? Well, for starters they help to ward off inflammation, they are chock full of vitamins A and C which supports healthy, glowing skin, and they can even enhance your memory with the abundance of flavonoids found inside each little berry. Did we just mention that they boost brain health? Other foods that help in this area are avocados, leafy greens, beets and walnuts – so eat up, every chance you get! 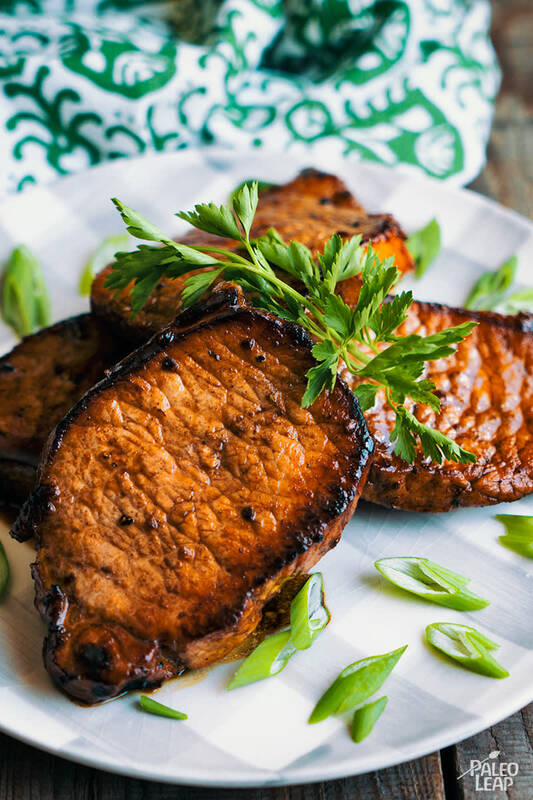 This recipe only takes a matter of minutes (outside of the marinating time) in terms of dinner preparation, which leaves you with plenty of thoughtful moments to get prepared with a side dish of grilled zesty sweet potatoes. And while you are cutting up those sweet potatoes, remember the muffins mentioned up above. In a small bowl combine the cayenne pepper, garlic powder, paprika, salt and pepper. Season the pork chops with the spice rub. Place blueberries in a medium saucepan over medium-high heat. Add the fresh garlic, honey, balsamic vinegar, and season to taste; let simmer 10 to 12 minutes. Mash the blueberries and let the sauce cool. Place the pork chops in a marinating container, and pour the blueberry sauce over the chops making sure they are well covered. Cover and refrigerate 2 to 12 hours. Remove the pork chops from the marinade, and cook the pork chops 4 to 5 minutes per side, or to the desired doneness.